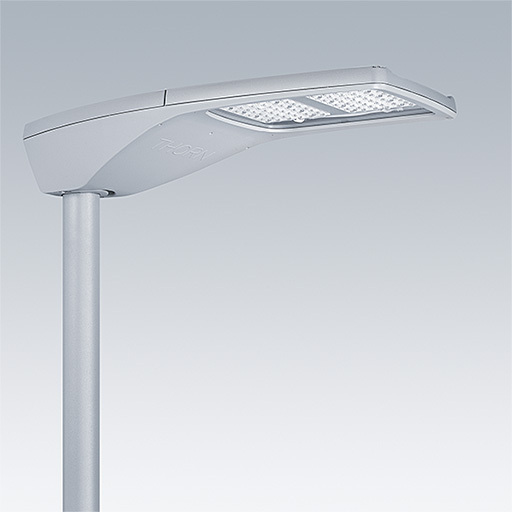 A medium size LED road lighting lantern with 96 LEDs driven at 900mA with Wide Street optic. Electronic, fixed output control gear. Class II electrical, IP66, IK08. Housing: die-cast aluminium, powder coated textured light grey. Diffuser: tempered flat glass. Screws: stainless steel, Ecolubric® treated. Post top (Ø60/76mm, tilted 0°/5°/10°) or lateral (Ø34/42/49/60mm, tilted 0°/-5°/-10°/-15°) mounting. Complete with 4000K LED. For lateral mounting to Ø34/42mm spigots an adaptor (59005490 R2L2 MA34/42 NPA) should be ordered separately.